For today’s Ways to Use It Challenge (WT429), we are to “doodle” on our cards. So I took a Copic multiliner pen and doodled around the oval behind my sparkly ice cream cone and also all around the edge of the designer paper background. The images are from North Coast Creations. After stamping the ice cream & cone, I colored it w/ Copics, then went over both scoops and parts of the cone w/ a VersaMark pen and embossed w/ Holographic powder. The sentiment was stamped w/ the chalk ink and embossed w/ the Indian Spark embossing powder. Then I die cut it first using a petite oval die, then I placed a larger rectangle die over it to cut off the sides. The aqua layer was die cut w/ the ODBD Antique Label die and I ran the VersaMark pen around the edges and embossed w/ the Indian Spark powder. After doodling around the edges of the designer paper( this paper is already very sparkly) everything was attached to a 4.25 x 5.50 card. Stamps: North Coast Creations – What’s the Scoop? A big congrats to Vicki, the Featured Stamper on Splitcoast (FS329)! What a wonderful gallery she has! I chose her Thanks card to case. I kept the layout and flower theme, but I used different images, different colors and a different embossing folder. 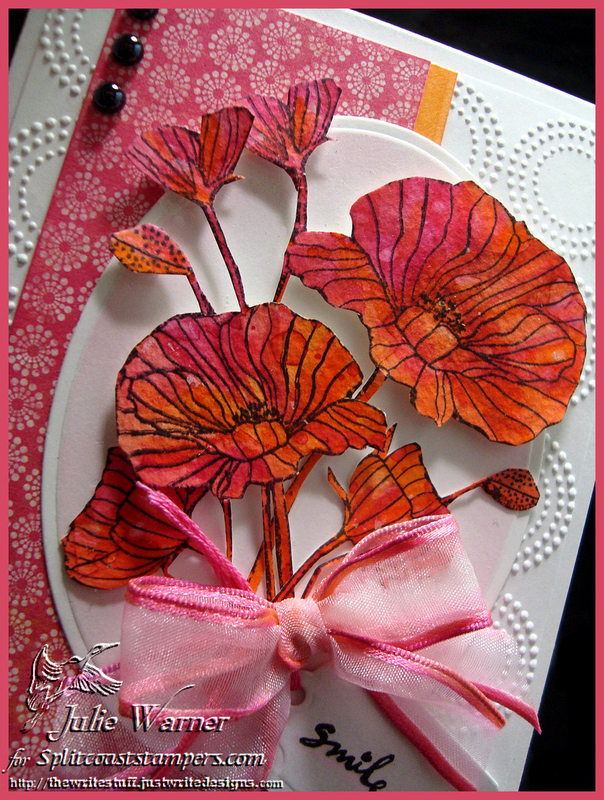 I had a background I had water colored using reinkers, and I liked the colors, so I stamped the poppy image on top. I really wanted a white bg like Vicki’s so I fussy cut the poppies and placed them on a very lightly sponged die cut oval. A bow and die cut tag w/ the sentiment were added. I used a strip of dp and for the very narrow orangey strip, I just ran an apricot Copic marker down a piece of white c/s to get the color. The white bg was embossed and then everything was attached to my 4.25 x 5.50 white card. I added a bow (it was white and I colored it w/ Copics) and a few black pearls to finish it. Congrats again and enjoy your week, Vicki! Thanks so much for stopping by! Have a great Memorial Day! Today’s Free For All Challenge on Splitcoast (F4A170) is to repeat something. And since I needed another wedding card (getting to be that time of year, lol), I combined the two. And for my repetition, I gold embossed one window on ivory card stock, and embossed another one using verdigris embossing powder. I die cut the verdigris window and attached the frame on top of the gold embossed window. Some subtle coloring was added to the stained glass using Copic markers. The images are all from Our Daily Bread designs. The sentiment was also gold embossed and die cut. 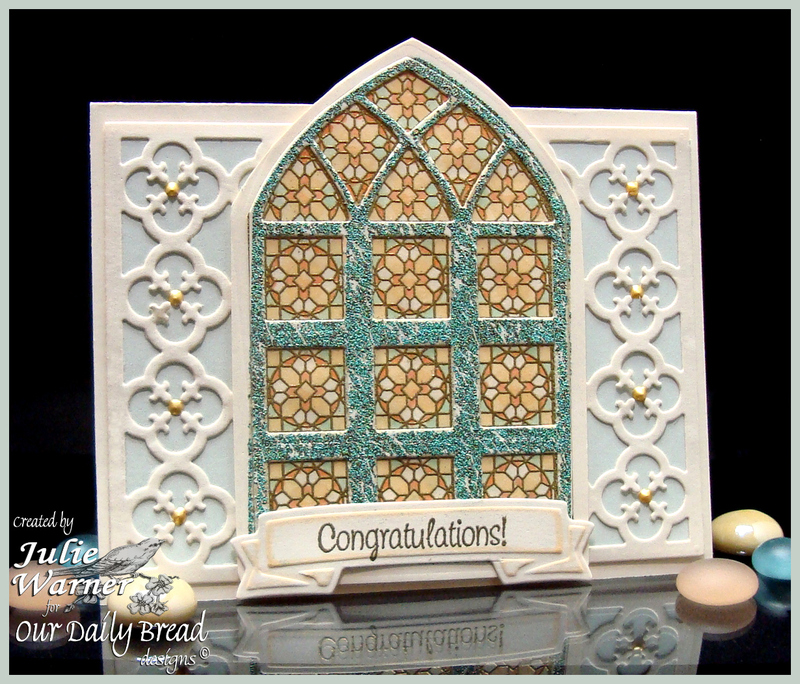 The window is on top of a die cut quatrefoil background and I attached it on top of a very pale green panel before attaching to my 5.50 x 4.25 card. Little dots from a gold Pearl Pen were added in the centers.